As we sort through this early season slate of games in the very young 2016 Major League Baseball season, there’s still plenty to determine about this year’s crop of third basemen. Obviously, there’s an elite group and another tier or two of veterans that are well-established. Then, there are others trying to establish themselves or maintain any semblance of value. These might be young cats or platoon guys that maintain third base eligibility trying to muster up some fantasy value here early in the year. And then right in the middle of the mix of all of this is Matt Duffy. Matt Duffy is one of the more intriguing players in the third base picture for this year. The results from his first two games notwithstanding, he’s a player that could certainly trend in either direction in 2016, as we saw a little bit of both sides of him throughout the 2015 season. Duffy did everything pretty well throughout last year. There was some occasional power, with 12 homers and a .133 ISO, and some speed, with a dozen of those as well. He demonstrated decent on-base skills, living off of a .336 BABIP in order to slash .295/.334/.428/.762. All in all, it was a quality first full year for Duffy, but it was also one in which he maintained second base eligibility for the large part of it, making him all the more attractive as a fantasy option. But entering a crowded field at third base could certainly have done him in during the draft season, as Fantasy Pros had him averaging about 156th overall across five different fantasy platforms. In that respect, Duffy isn’t likely to be a guy that too many reached on. As such, he could end up being a decent sized steal or just a guy who exists at any point throughout the season. But when we look at what Duffy did last year beyond standard categories, we can jump to some sort of conclusion as to which direction in which we should expect him to trend before we get too deep into this 2016 campaign. While that trend could likely be seen as solely positive or negative, in terms of his overall production, it’s also worth exploring whether or not we might rely on Duffy as more of a power guy, perhaps closer to the neighborhood of 20 homers, or a speed guy, maybe driving the swipes up to that 20 mark instead. Regardless of the outcome, and the latter is certainly favored based off of what we have seen from him thus far, Duffy certainly has one thing working in his favor: he makes a lot of contact. His 83.6% contact rate ranked eighth among third basemen last season, while his swinging strike rate was just 7.5%, which was near the bottom of the pack. His overall swing rate was at 46.4%, also near the bottom of the group at the hot corner. He also made soft contact only 14.8% of the time. Duffy loves him some fastballs as well, swinging at them just a touch over 47% of the time last year, having seen them 64.30% of the time overall. Brooks has a pretty nice overview of what that looks like, in terms of his swinging tendencies. And, because all pitch types are not created equally, here’s the rate at which he actually saw each of the three pitch types for comparison’s sake. Obviously the sample is relatively small in 2014, and especially in 2016. Nonetheless, this should bode well for Duffy in continuing to make solid contact. Essentially, he sees a lot of fastballs and he swings at a lot of fastballs. So the approach is there and his contact should allow him to remain in decent standing in terms of his average and on-base percentage. Because of that high contact rate, as well as his batted ball tendencies, Duffy’s skill set definitely lends itself more to seeing an uptick in the speed game this season. He hits a number of linedrives (20.9% in 2015) and groundballs (57.1%), and his ability to run the bases effectively contributed to his 20 infield hits that trailed only Brett Lawrie among qualifying third basemen last year. Additionally, Duffy is a guy that stole 20 bases twice in the minor leagues, in addition to his dozen last year, so it isn’t out of the realm of possibility, at all, that he can reach that mark in his second full big league season. At this point, however, it seems unreasonable to expect any sort of consistency from Matt Duffy in the power game. He hit 12 home runs last year across 612 plate appearances, but only four of those came in the second half of the season. His 170 pound frame and his swing, something we could certainly delve into later, don’t necessarily allow for many flyballs, let alone getting them out. As far as his swing is concerned, in short, there isn’t a ton of load there that would indicate home run power (but again, something worth exploring later). His 26.5% flyball rate was only ahead of Yunel Escobar among qualifying third basemen. Combine that with the fact that he plays his home games in San Francisco, not exactly known for being a friendly park for power hitters, and there isn’t necessarily reason to think that Duffy will hit above maybe 12-15 homers a season. 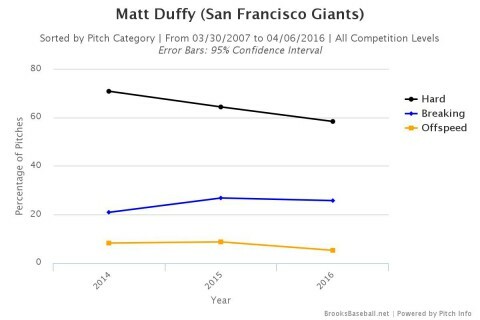 In terms of which direction in which Matt Duffy finds himself trending, there isn’t any reason to think that he’s going to see a rapid decline. A slight regression is possible sure, based off of the .336 BABIP alone, but he has the approach and the ability to make quality contact that should ensure that number doesn’t fall off too badly. But does the likelihood of him becoming more of a quality OBP player with some steals and not so much a power guy leave him as a coveted fantasy option? Not necessarily. We’ll have to continue to monitor what an uptick in steals, if it actually takes place, looks like before making a true assessment. But while Duffy should continue to trend in a positive direction, as far as his performance is concerned, he’s going to have a relatively difficult time standing out among a thick group of third basemen with his current skill set. Of course, there’s always the possibility that his early demonstration of power, with a pair of no-doubter homers against Milwaukee in the season’s opening series, could be a thing to watch moving forward, in which case we would re-evaluate at a later date. 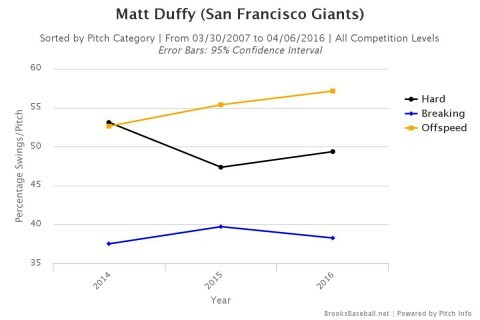 We hoped you liked reading Matt Duffy: In Which Direction Will He Trend? by Randy Holt! The Sleeper and the Bust Episode: 329 – Cool (Trevor) Story, Bro! He also hit only 4 infield flies all last year, another reason to believe that his BABIP will stay pretty high (aside from the large number of infield hits). Something which might affect his stats is that for a lot of last year he hit 3rd, ahead of Posey, and that probably affected how he was pitched to–he walked only 4.0% when hitting 3rd but 5.9% otherwise, and it’s reasonable to suppose that was because no one wants to walk the batter ahead of Posey. This year he’s hitting 6th so far, ahead of Crawford, and while Crawford did actually lead the team in HRs last year he only hits in the .250s.